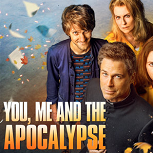 In a Nutshell: NBC will fill the Thursday 8/7c timeslot vacated by Heroes Reborn with the apocalyptic dramedy You, Me and the Apocalypse, a 10-episode co-production with Sky TV in the UK. It debuts just over a year after it was first greenlit, and the entire order has already aired across the pond. The cast includes several names familiar to NBC, from Rob Lowe to Jenna Fischer to Megan Mullally. Best Case: One of the biggest ratings surprises in 2015 was the breakout start from The Last Man on Earth, which put a comedic spin on the end of the world... just like this show! NBC is finally starting to get some comedy viewers back with the solid performance of Superstore, and those viewers will recognize a lot of the names on this show. Like Last Man, it can be about a league average player. 1.51. Worst Case: It's The Slap all over again; NBC has buried The Blacklist with a short-order lead-in that has no real prayer of hooking viewers. Anyone really interested in this could've pirated it already. It seems virtually impossible it could do much worse than The Slap, but it might be possible to do at least a little worse. 0.58. Likeliest: It's actually gotten some really good reviews, but my first impression of the promos was that they made this look like a cheap, cheesy summer co-production. I think most viewers will respond the same way and take a pass here, and it'd definitely be an overachievement if it can manage Heroes Reborn numbers on a regular basis. I kinda feel like the concept/cast can draw a bit better than year-ago megabomb occupant The Slap, especially since NBC seems increasingly healthy in general. But it has a few more episodes than The Slap, so I think those weeks drag it down very close to that show's raw average: 0.77.